On June 25, 2014, Reuters reports that China has unveiled a new official map of the country giving greater play to its claims on the South China Sea by making the disputed waters and its numerous islets and reefs more clearly seem like national territory. Although previous maps published by Beijing included China’s claim to most of the South China Sea, that claim was depicted in a little box in a bottom corner to enable the rest of the country to fit on the map. That placement made the South China Sea’s islands appear more like an appendage rather than an integral part of China. The new, longer map dispenses with the box, and shows continental China along with its self-declared sea boundary in the South China Sea — stretching right down to the coasts of Malaysia, Vietnam and the Philippines — on one complete map. Click map to enlarge. Note the purple dashes marking the South China and East China Seas as parts of China. Indeed, China’s recent aggressive moves in the South China Sea, as well as last November’s declaration of an Air Defense Identification Zone over the East China Sea, are but indicators of an overall policy shift by the Chinese military from a land-based to an ocean defense strategy. An article in [Beijing’s Guofang journal] National Defense in 1995 explains that, “In the past, for a long period of time,” humanity primarily relied on land for their survival and development, thinking that “national territory (guotu 国土) only meant dry land.” But in today’s world, due to rapid increases in population and dwindling land and resources, “national territory” must mean more than “land territory” (lingtu 领土) but should include “territorial waters” (linghai 领海). This has led nation-states to turn to the “oceans” (haiyang 海洋) — most of which are still “virgin territory” — in their search for new “living space” (shengchun kongjiang 生存 空间). 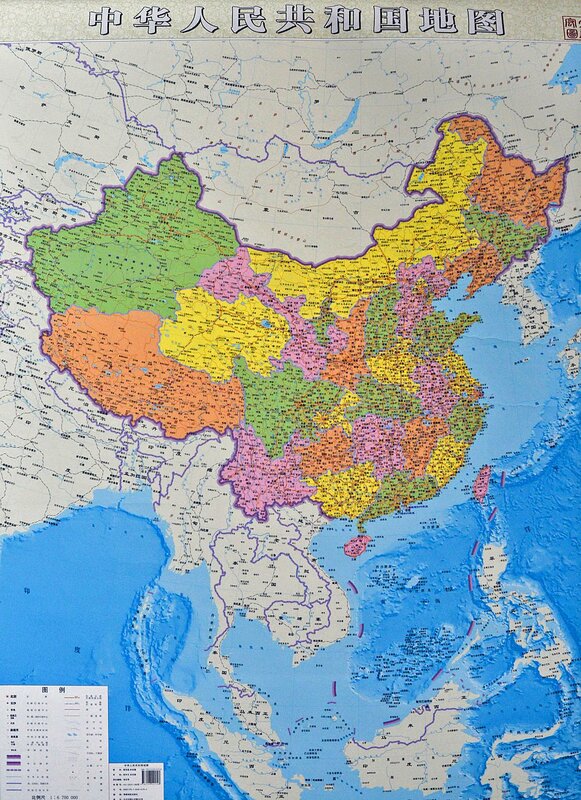 The PRC now conceives oceans to be its “second national territory” (dier guotu 第二 国土). It defines “maritime national territory” (haiyang guotu 海洋国土) as “the maritime portion of any land and space belong to or under the jurisdiction of a coastal country.” China’s “second national territory” includes 12 territorial seas (linghai 领海), 24 “maritime adjacent regions” (haili pilian qu 海里毗连区), 200 maritime economic exclusive zones and continental shelves — totaling more than 3 million square kilometers or one-third of China’s land mass. Defense of its “national maritime territory” requires Beijing to shift its defense strategy from one of “coastal defense” (jin’an fangyu 近岸防御) to “offshore defense” (jinhai fangyu 近海防御). National Defense maintains that since “the frontline of maritime national defense lies beyond China’s territorial waters . . . there will be times” when China’s defense of its seas “may require doing battle in farther maritime regions” including “international waters and seabeds.” China’s perimeter of “offshore defense” is conceived to include two “island chains.” The first chain stretches from the Aleutians to the Kurils, the Japanese archipelago, the Ryukyus, Taiwan, the Philippine archipelago, and the Greater Sunda Islands. The “second island chain” comprises the Bonins, the Marianas, Guam, and the Palau archipelago. 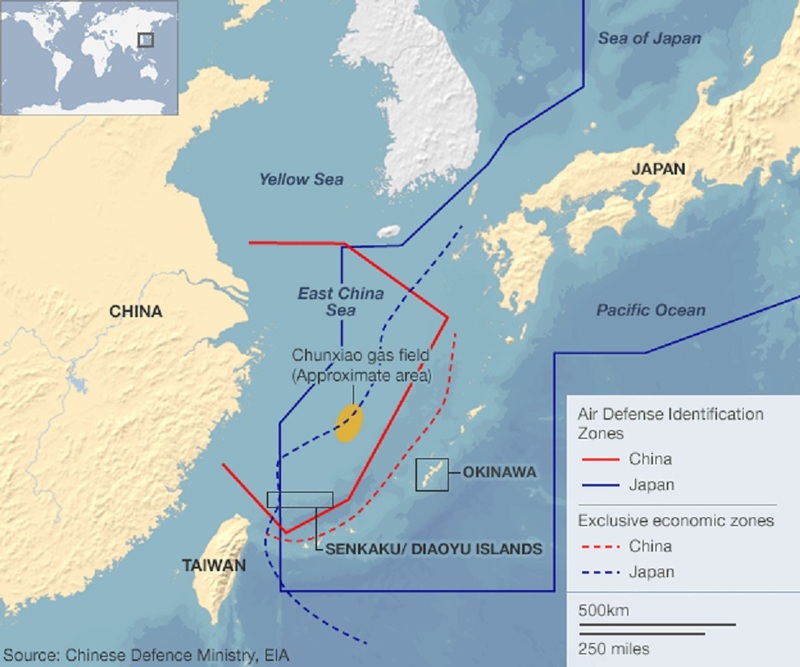 On Nov. 23, 2013, China unilaterally announced an East China Sea Air Defense Identification Zone (ADIZ) which includes the Japan-held Senkaku Islands, which Chinese call Diaoyutai and over which China also claims ownership. Since that declaration, Japan and South Korea have refused to accept China’s ADIZ, while the Obama administration has sent mixed signals — at first seemingly challenging the ADIZ by flying two unarmed B-52 bombers over the East China Sea (and the disputed Senkaku islands), then seemingly accepting the ADIZ so long as China not require all aircraft, commercial and military, to check with Beijing before flying through the ADIZ. It turns out that China’s ADIZ isn’t solely motivated by Beijing’s irredentist claim over the Senkakus, but reaches beyond those disputed islets to include none other than the First Island Chain. The PRC [People’s Republic of China] now conceives oceans to be its “second national territory (dier guotu). 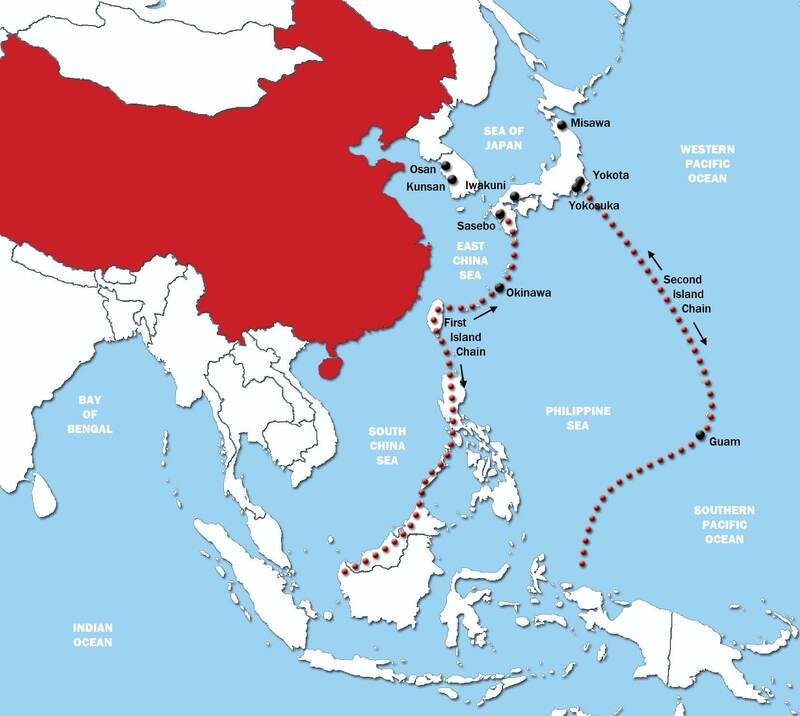 … China’s “second national territory” includes 12 territorial seas …, 24 “maritime adjacent zones”…, 200 maritime exclusive economic zones and continental shelves — totaling more than 3 million square kilometers or one-third of China’s total land mass. Defense of its “maritime national territory” requires Beijing to shift its defense strategy from one of “coastal defense” … to “offshore defense”…. National Defense maintains that since “the frontline of maritime national defense lies beyond China’s territorial waters … there will be times” when China’s defense of its seas “may require doing battle in farther maritime regions” including “international waters and seabeds.” China’s perimeter of “offshore defense” is conceived to include two “island chains.” The first chain stretches from the Aleutians to the Kurils, the Japanese archipelago, the Ryukyus, Taiwan, the Philippine archipelago, and the Greater Sunda Islands. The “second island chain” comprises the Bonins, the Marianas, Guam [a U.S. territory], and the Palau archipelago. China’s announcement of an air defense identification zone (ADIZ) caused an uproar in Japan, the United States, Australia, Canada and other Western countries. Japan and the U.S. even sent military planes as an act of provocation. Their media also rallied together to attack China. Some people laughed at China, saying that the ADIZ is a “disgrace,” “useless,” “a paper tiger.” But in truth, their reaction proves that China’s ADIZ is like a fishbone that’s stuck in the throats of Japan and the U.S.
China’s establishment of the ADIZ is not only a matter of the sovereignty of our core national interests and of economic importance; it also has great strategic significance. The United States not only has never accused Japan for its ADIZ, but strongly supports it. Why do these two countries cooperate so seamlessly? Their purpose is, through Japan’s ADIZ, to achieve a blockage of China’s sea and air passages in the first island chain. “Crisis Over Senkaku: China declares East China Sea Air Defense Identification Zone,” Nov. 24, 2013. “PLA activities in First Island Chain,” September 14, 2013. “China’s irredentist nationalism and the six wars to come,” Sept. 23, 2013.